Instead of perpetually shaking your head in frustration because you don't know what your pet hamster wants when he squeals loudly and incessantly, try to uncover the true meaning behind his hammie vocalization. Hamsters use body language and vocalization techniques to express their feelings, contentment, anxieties and wants -- not too different from a human being. If a hamster produces a high-pitched squealing or squeaking sound, then it's most likely a sign that the poor thing is having a problem of some sort. He may be frightened, he may feel under the weather or he simply may be hungry, for just a few specific possibilities. Whatever the case is, you may want to take a look at your cutie to make sure that he's OK. He's communicating something by squealing, and he may even need your help or a trip to the veterinarian. When your hamster's movements just seem "off," it also can be a sign of a wellness issue. Perhaps your hammie's posture is crouched and he's walking in a much slower manner than usual, almost like he's creeping around to be clandestine. If your hamster does this, he may be expressing severe physical pain or discomfort to you, similarly to squealing. Puppies aren't the only pets that can have pesky chewing habits. A hamster that gnaws on the bars of his cage is very likely a bored little rodent, and wants some entertainment, attention and fun -- stat. The chewing may be his sly way of trying to show you that he wants some different toys, perhaps. Like many other species of animals, hamsters frequently also use scent marking to convey messages to others. If your wee pet keeps pressing his body against random items, he just may be marking his turf and claiming his own territory -- "Back off, guys. This toy is mine!" Hammie scent glands are situated in their hip region. In the hamster world, yawning isn't a way to communicate exhaustion, but often rather sheer contentment. If your hamster is yawning up a storm, it's probably not because he needs a nap, but because he's feeling pretty happy and calm at the moment. If he stretches as he yawns, you have even more proof that all is wonderful for your little one at the moment. In some cases, however, yawning in hamsters can even point to nervousness and exhaustion, so use context to the greatest of your ability when analyzing the situation. Hamsters also often groom themselves when they're feeling especially peaceful and at ease. If your hamster seems hyper, and alternates between grooming his fur and running around like a madman, he may be expressing anything from disorientation and anger to pure enthusiasm. One thing is for certain, however, and that is that you're dealing with one revved up rodent. 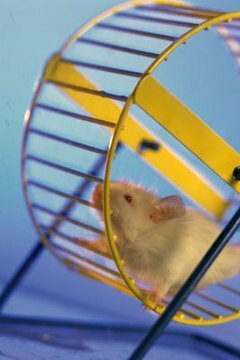 Inactivity and seemingly lazy behavior sometimes is how a hamster communicates that he doesn't feel good. If your normally boisterous bundle of energy won't even budge an inch, then it may be time to call the vet. Like felines, hamsters also sometimes communicate feelings of belligerence and fear through making hissing sounds. Leave your hamster alone if he's in this mode -- he needs some time to cool down. Teeth chattering also is how many hamsters communicate that they do not want company at the present time. If your hamster's mouth is making grinding sounds, then he's basically telling you to stay away. If you don't respect his wishes and back off, he may even nip at you. If a hamster's ears are pointing back, he may be communicating that he's too tired to do anything at the moment, especially when combined with half-shut peepers. If you don't leave him be, he may even bite you, so be very careful.